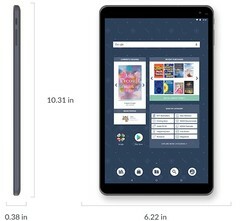 Powered by an unspecified processor — most likely a low-end MediaTek chip — the 10.1-inch NOOK Tablet 10.1 comes with 32 GB of internal storage space and promises more than 8 hours of autonomy. Those interested will find this US$129.99 slate in Barnes & Noble stores starting on Wednesday, November 14. The world's largest bookseller, namely Barnes & Noble, is back with a new tablet that joins the NOOK lineup as the device with the largest display in the family. According to the official press release, this slate "is perfect for reading, as well as 2 in 1 tablet capabilities for browsing, taking pictures, or sending emails," but we beg to differ: a 2 MP camera is far from perfect nowadays. This new slate does not offer any impressive features, and some of the essential specs — the processor and amount of memory, for example — are not even mentioned on the official product page. However, this is a low-end tablet that focuses on battery life (up to 8.5 hours) and screen size/resolution (10.1-inch IPS with 1,920 x 1,200 pixels). The list of specs and features also includes dual-band WiFi 802.11 a/b/g/n/ac, a 3.5 mm audio jack, micro USB 2.0 connectivity, 32 GB internal storage and microSD support up to 256 GB, a 2 MP camera on each side, as well as support for a portable keyboard cover and charging dock (sold separately and not listed by Barnes & Noble yet). If you were wondering, this slate apparently runs Android and comes with full Google Play Store support, but nobody bothered to reveal what Android version we are talking about here. At last, we should also make one thing clear: the new NOOK is not a re-branded Samsung slate as some previous NOOK slates, being apparently manufactured by a Chinese OEM called Jingwah Information Technology (according to Liliputing). Would you spend US$130 on this slate? Starting on November 22 and until December 26, those interested could get it for just US$119.99, but there is also another promotion that runs until December 31 and includes a charging dock and US$50 worth of cooking ebooks, all for US$159.99.